Examples with detailed solutions on solving rational inequalities are presented along with detailed solutions. The sign of a rational expression P/Q , where P and Q are polynomials, depends on the signs of P and Q. In turn the signs of P and Q depend on the zeros of P and Q respectively if there are any. Hence the sign of P/Q depends on the zeros of both P and Q and changes (if it does!) only at these zeros. So to solve an inequality of the form P/Q > 0 (or P/Q < 0), we first find the zeros of P and Q then make a table of sign of P/Q. The numerator is always negative and therefore does not change sign. 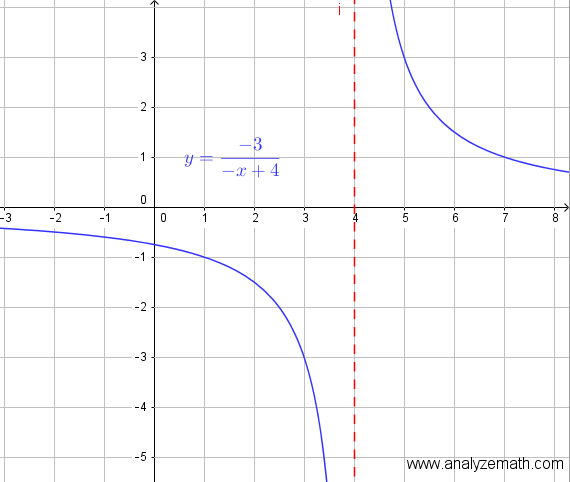 Zero of the denominator: solve -x + 4 = 0 to obtain x = 4. We now select and test values that are within each interval and test the rational expression to find its sign. We now evaluate at x = 0 to find its sign. We now evaluate at x = 5 to find its sign. Graphical solution to the given inequality. 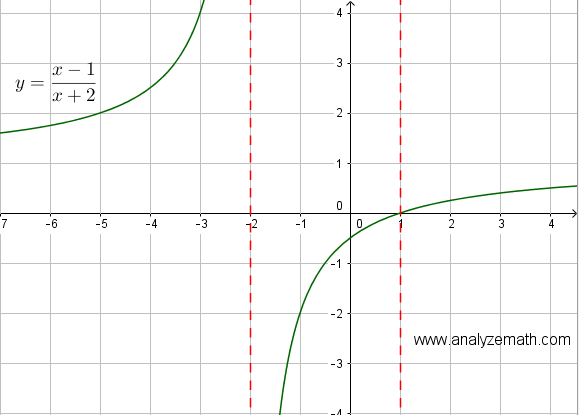 Zero of the numerator: solve x - 1 = 0 to obtain x = 1. Zero of the denominator: solve x + 2 = 0 to obtain x = -2. The two zeros x = 1 and x = -2 divide the real number line into three intervals (Note that the zeros are ordered from smallest to the largest). We now evaluate at x = -3 to find its sign. We now evaluate at x = 2 to find its sign. (- ∞ , -2) U (1 , + ∞). NOTE: Do not multiply both sides by the LCD (x - 3)(x + 4) as you would do if this was an equation. The sign of (x - 3)(x + 4) changes with x and we do not know if the order of the inequality is to be changed or not. 3 / (x + 4) from both sides. Rewrite the inequality so that the two terms making the left side have common denominator. The three zeros divide the real number line into four intervals (Note that the zeros are ordered from the smallest to the largest). We now evaluate ( -x + 17) / [ (x - 3)(x + 4) ] at x = -5 to find its sign. We now evaluate ( -x + 17) / [ (x - 3)(x + 4) ] at x = 0 to find its sign. We now evaluate ( -x + 17) / [ (x - 3)(x + 4) ] at x = 4 to find its sign. We now evaluate ( -x + 17) / [ (x - 3)(x + 4) ] at x = 18 to find its sign.